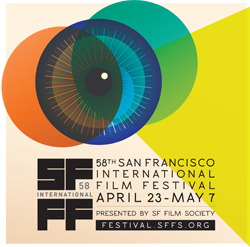 Film lovers are in for a wonderful treat at this year’s 58th San Francisco International Film Festival (April 23 -May 7, 2014). With so many terrific films it is always a challenge to find out which ones to watch. Here are five films from different genres and parts of the world that I enjoyed watching and came away learning something new about different societies, countries and the filmmakers themselves. The films I saw were two American, one each from China/Hong Kong, Albania and Israel. There are lots of other films I want to watch and hope to catch them at the festival. “T-Rex,” is an inspirational documentary about 17 year old Clarrisa Shields journey to winning a gold medal at the Olympic Games. It was amazing to watch how Shields overcomes poverty, a damaged home and develop this inner determination to became an ace athlete to win a gold medal in women’s boxing. “Best of Enemies,” will appeal to news and political junkies or those simply curious to find out how this whole culture of political talk shows evolved on American television. The documentary takes you back to the 1968 election and the famous debate between William F. Buckley and Gore Vidal. Buckley was a well-known conservative thinker, writer and TV personality, while Vidal was a well-known liberal and a prolific writer. The documentary traces the importance and relevance of the debate and how it shaped Buckley and Vidal’s image of each other. I was rooted to my chair as I watched this documentary and the battle of wits between these two intellectual pundits. That era of Pandit TV in America has long gone is what you realize. “Black Coal , Thin Ice,” is a riveting film noir about a serial killer from Hong Kong/China. Through this dark and intense thriller film we get to see a different side of China and Chinese society. This was the first time I watched a Chinese whodunit film and I could not have picked a better one to watch this genre of film. Diao Yinan, director and writer of the film apparently spent years working on the script that is tightly woven with lots of powerful and unexpected twists. Yinan’s film won the Golden Bear award at this year’s Berlin film festival. “Bota,” unfolds in slow sort of a way in a remote place, almost like a no-man’s land in Albania. You wonder what dreams and secrets are hidden and buried in this tiny place especially from its terrible dictatorship period? The film revolves around a cafe called Bota, which means the world in Albanian. On the surface the film might look simple and quirky, but by the end of the film you realize that is not the case. Life is nasty, brutish and short that famous line from Hobbes came to mind after I finished watching the film. And yet people learn to survive and create a world of dreams and aspirations. Sometimes they succeed, and at other times they don’t. Watch this space for another post on the next installment of films I liked.